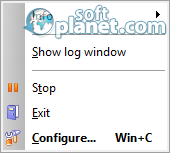 SoftPlanet makes it possible for everyone to get free Actual Transparent Window download directly from our servers. There is no registration needed for downloading. Bring New Dimensions to Your Desktop! 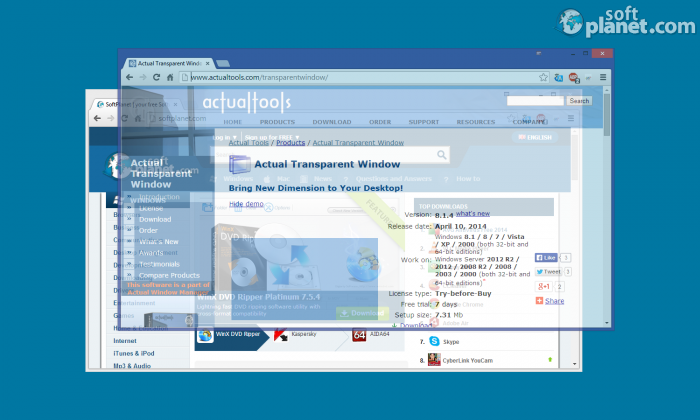 Actual Transparent Window version 8.1.4 is a really simple-to-use software utility, which enables you to adjust the transparency of your currently open windows. Thus you can easily check the content from the window below your current one without switching them. It is very appropriate, when you need to see something tiny. Now it is not necessary to switch among screens for each single character. Such an app can really improve your performance as well. What Actual Transparent Window 8 offers to you is an entirely new approach of organizing your desktop. With this software, you don't have to minimize and restore windows every time. 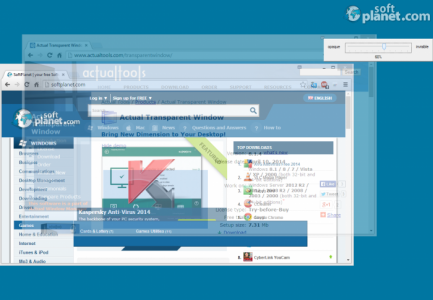 You are able to adjust window transparency for each single application separately. In addition, you are able to activate Ghost mode. After activating it, all mouse clicks and moves are to be made through the transparent window to underlying windows. 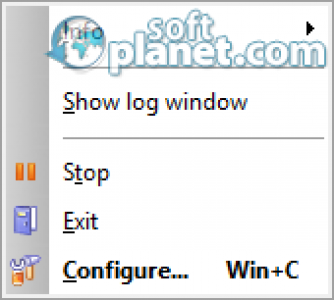 Just like all Actual Tools products, Actual Transparent Window embeds a tiny button (Make Transparent) within the title bar of your windows, which provides you with quick access. Besides that it puts an icon within your system tray, where you can find adjust Actual Transparent Window settings. If you right-click over the small icon within your window title bar you will view the opaque/invisible bar, which enables you to adjust the transparency. Please be aware that once you apply a particular transparency value, it becomes the current one for the Make Transparent button. We really thought that it is a good idea to have a mode such as Ghost mode. However it turns out that it can just ruin your working process and reduce your performance. We really couldn't think of any valuable application of this feature, besides using it like a prank for a friend. However everything about this software is just great. We strongly recommend to adjust all hot keys first before using the app. 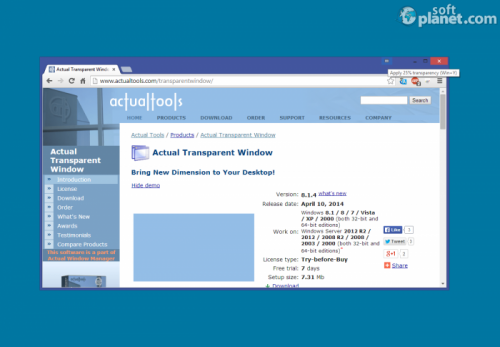 Thus you can easily change the transparency of your windows. The main feature of Actual Transparent Window has almost unlimited applications. If you daily PC use includes opening various windows simultaneously, you should definitely download Actual Transparent Window 8.1.4. It is just great. It can really improve your user experience a few times. Please do not hesitate to post your observations within our Comments field down below. Actual Transparent Window is VIRUS-FREE! Our security scan shows that Actual Transparent Window is clean from viruses. The current version of Actual Transparent Window has been scanned by our system, which contains 46 different anti-virus algorithms. That ensures that Actual Transparent Window 8.1.4 is 100% safe for your computer.